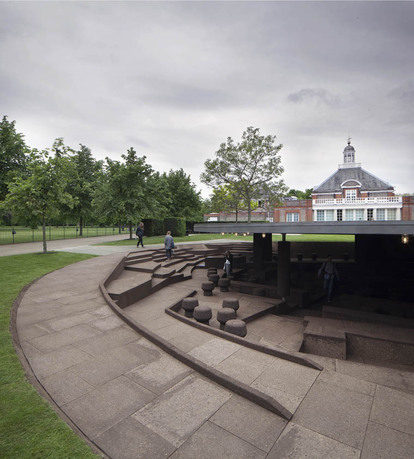 Herzog & de Meuron and Ai Weiwei, Serpentine Gallery Pavilion, 2012, London, United Kingdom. 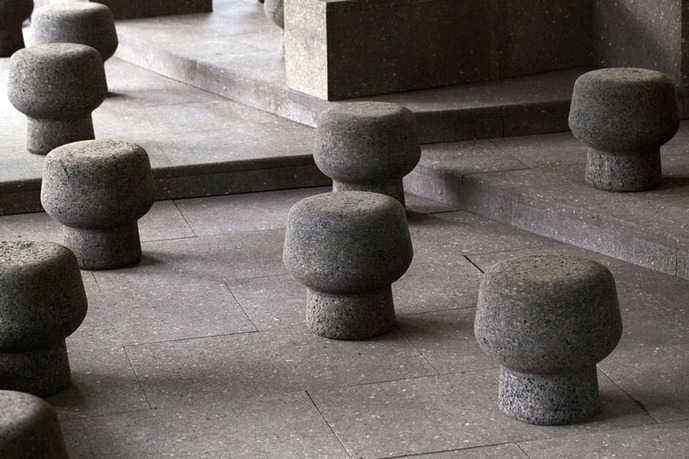 Copyright: Herzog & de Meuron and Ai Weiwei. Image copyright: Iwan Baan. 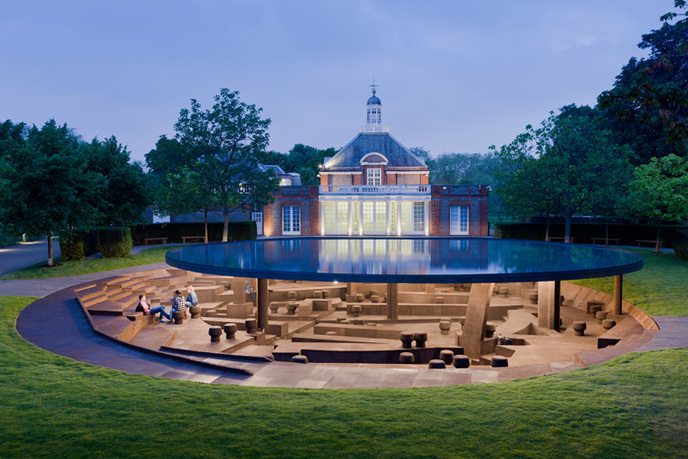 The Serpentine Gallery is proud to present the 2012 Pavilion designed by Herzog & de Meuron and Ai Weiwei. It is the twelfth commission in the Gallery's annual series, the world's first and most ambitious architectural programme of its kind. 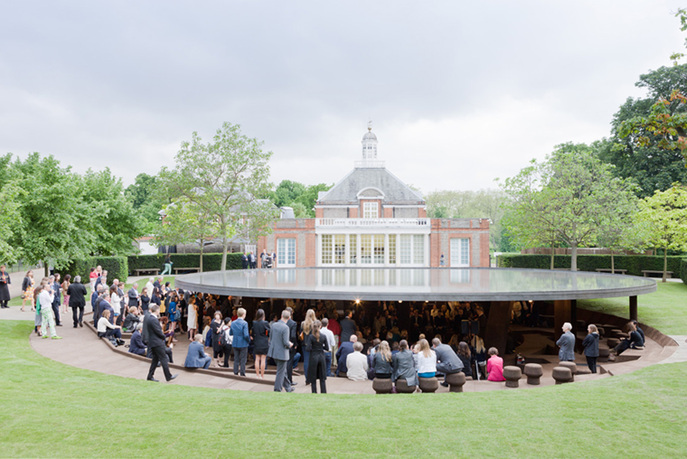 This year's Pavilion takes visitors beneath the Serpentine's lawn to explore the hidden history of its previous Pavilions. Eleven columns characterising each past Pavilion and a twelfth column representing the current structure support a floating platform roof 1.5 metres above ground. The Pavilion's interior is clad in cork, a sustainable building material chosen for its unique qualities and to echo the excavated earth. Taking an archaeological approach, the architects have created a design that will inspire visitors to look beneath the surface of the park as well as back in time across the ghosts of the earlier structures. Born in Basel in 1950, Jacques Herzog and Pierre de Meuron studied architecture at the Swiss Federal Institute of Technology Zurich (ETH) from 1970 to 1975, with Aldo Rossi and Dolf Schnebli. They received their degree in architecture in 1975 and established Herzog & de Meuron in Basel in 1978. Their practice has designed a wide range of projects from small-scale private home to large-scale urban design. While many of their projects are highly recognized public facilities, they have also completed several distinguished private projects such as apartment buildings, offices, and factories. In their many projects, Herzog & de Meuron have worked with artists, including their collaboration with Ai Weiwei, which resulted in the design of three realized projects to date, including the Beijing National Stadium. Jacques Herzog and Pierre de Meuron have been visiting professors at the Harvard Graduate School of Design since 1994. They are also professors at ETH Zurich (since 1999) and cofounders of the ETH Studio Basel–Contemporary City Institute (2002). Chinese conceptual artist Ai Weiwei also works as an architect, photographer, curator, and globally recognized human rights activist. Born in 1957 in Beijing, he began his training at Beijing Film Academy and later continued at the Parsons School of Design in New York. His work has been exhibited around the world with solo exhibitions at Stiftung DKM, Duisburg (2010); Mori Art Museum, Tokyo (2009); Haus der Kunst, Munich (2009); Sherman Contemporary Art Foundation, Cambelltown Arts Center, Sydney (2008); and the Groninger Museum, Groningen (2008). He has also participated in the Forty-Eighth Venice Biennale in Italy (1999, 2008, and 2010); the Guangzhou Triennale in China (2002, 2005), the Busan Biennial in Korea (2006), Documenta 12 in Germany (2007), and the Twenty-Ninth Sao Paulo Biennial in Brazil (2010). In October 2010, Ai Weiwei's Sunflower Seeds was installed in the Tate Modern Turbine Hall, London. Ai Weiwei participated in the Serpentine Gallery's China Power Station exhibition in 2006, and the Serpentine Gallery Map Marathon in 2010. Julia Peyton-Jones is the director of the Serpentine Gallery and codirector of its exhibitions and programs. 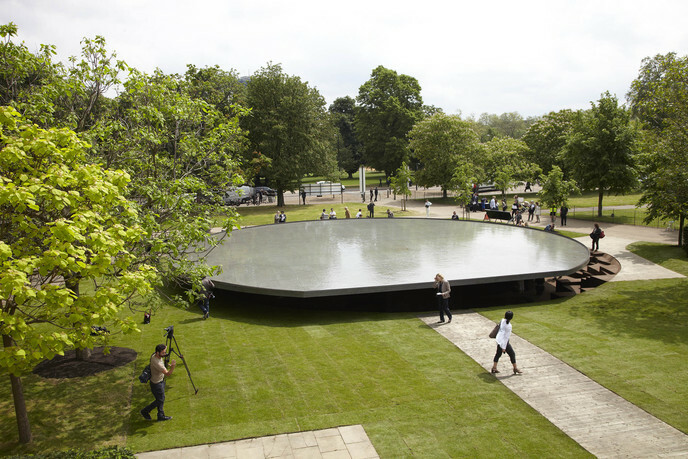 Peyton-Jones conceived the Serpentine Gallery Pavilion Program in 2000 as a pioneering way to present exhibitions of contemporary architecture to the public in the form of built space rather than plans and models. Hans Ulrich Obrist is the codirector of exhibitions and programs and director of international projects at the Serpentine Gallery. Since joining the Gallery in 2006, Hans Ulrich has played a key role in defining and curating the Pavilion Program, primarily the Marathon events which close each season and have subsequently inspired similar events in Reykjavik and the Solomon R. Guggenheim Museum of Modern Art in New York. 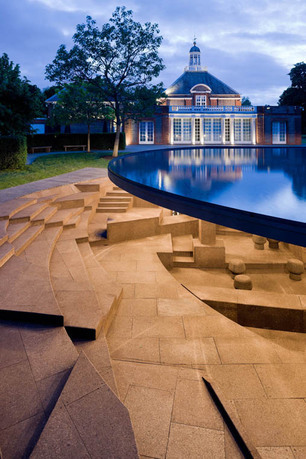 Serpentine Gallery is one of London's best-loved galleries for modern and contemporary art. Its exhibition, architecture, education, and public programs attracts up to 800,000 visitors in any single year. It is the only publicly funded modern and contemporary art gallery in central London that consistently maintains free admission and remains open seven days a week, with full disability access. 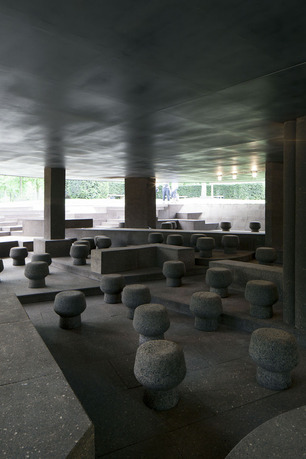 Since 1970, the Serpentine has gained an international reputation for excellence, presenting pioneering exhibitions of over 1,500 artists, architects, and designers over 42 years. The annual Serpentine Gallery Pavilion is globally unique and presents landmark buildings by internationally acclaimed architects who have not yet completed a structure in England. It attracts up to 250,000 visitors in any one year, rivaling the Venice Architecture Biennale. The Pavilion consistently features as one of the Top 10 Most Visited Architecture and Design Exhibitions in the World: it was ranked 6th in 2011, by Peter Zumthor; 4th in 2010, by Jean Nouvel; and 3rd in 2009, by SANAA (the Art Newspaper annual visitors’ survey, April 2010–12).